with a D-Fuzz-It® Sweater/Fabric Comb! It doesn’t surprise us when people tell us how much they love their D-Fuzz-It® Sweater/Fabric Comb. People are excited to have a product that eliminates a problem they thought they were stuck with forever. And they've put it to all kinds of uses. Even the finest sweaters pill. It's part of the experience of wearing a luxurious fiber. Why not provide the finest tool to remove the fuzz? The D-Fuzz-It® Sweater/Fabric Comb removes fuzz from all kinds of woven or knitted napped fabrics such as cashmere, lamb’s wool and acrylic. D-Fuzz-It® Sweater/Fabric Comb works quickly and without harm to garments to keep good clothing looking new. It’s a terrific little affordable investment. Fuzz-free is the way to be. Who knew it could be so easy? 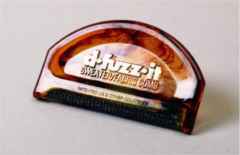 D-Fuzz-It® Sweater/Fabric Comb is a great promotional item. Display box headers can be customized. Describe the product! Advertise a promotion! To make sure your customers remember where they found this wonderful tool, each package sleeve provides a place for your business card or promotional material. Provide an easy, inexpensive solution to a problem, and your customers will return again and again. D-FUZZ-IT Sweater and Fabric Comb is a registered trademark of Oak Hill Industries Corp. Copyright© 2000 Oak Hill Industries Corp. All rights reserved.